This week played out like a Bruce Willis Die Hard movie. Explosions. Car chases. Innocent people killed. One suspect dead and the other captured. As everyone (including me) finally took time to exhale last night after a nail-biting week of twin bombings at the Boston marathon, the all-too familiar feeling of confusion, anger and terror consumed me…again. The first time was 10 years ago when I was in my high school religion class, watching a plane crash into the second tower of the World Trade Center. Yes, I saw it for myself, but my mind couldn’t register that this was real. This had to be a movie. When I finally did accept it, nothing was ever the same. Neither was the world. The Boston I use to visit every summer as a child will be changed too. But, the camaraderie of this strong-willed state will not. If this evil has put into question the lack of humanity in this world, you need look no farther than those traumatized citizens that jumped into action to save those maimed. Like Forum restaurant on Boylston street where the second bomb exploded on the patio of the eatery. Despite the mass of injuries, the restaurant workers sprung into action. Check the video to hear their story. 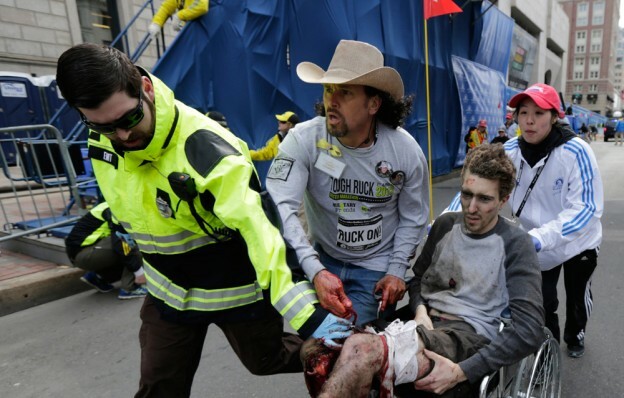 The most recognizable hero of this tragedy is Maine native Carlos Arredondo, who attended the marathon to honor his son killed in Iraq, after witnessing the carnage from the blast, he jumped over a security fence and ran towards the victims hurt. It was reported Arredondo tore off pieces of his sweater and tied them around the man’s thigh to stop him from bleeding out. Whispering to the hurt man that “you’re okay” he led him to an empty wheelchair that produced this iconic photo of the tragedy. But there were so many more. Ordinary citizens defied human instinct to make a difference. The Washington Post reported a Kansas doctor who completed the marathon left a post-marathon party to apply tourniquets. 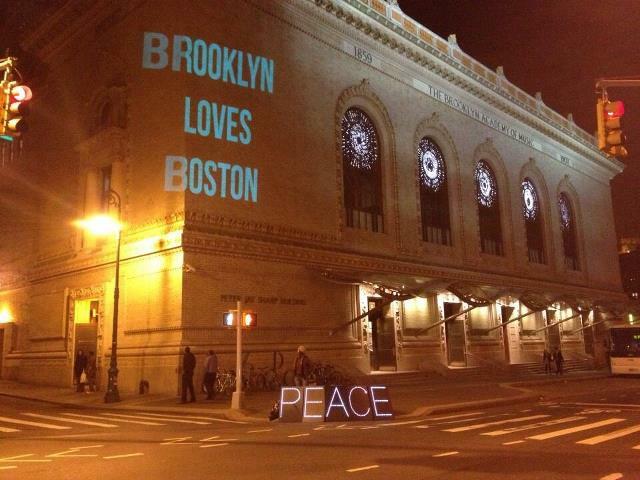 The love was also felt beyond the borders of Boston with New York restaurants–such as the Riviera Cafe and Sports Bar–donating 10% of its sales to Boston victims. Washington Heights resident Ella Ceron honored marathoners hurt in the blast by organizing a worldwide run for five minutes today. To the mayor, governor and every state representative that chose to literally shut it down, the whole state that is, to protect their citizens, *I salute you* for putting their needs first. And to the cops, firefighters and doctors and all first responders’ that turned ties, belts and scarves into tourniquets to help those whose limps were scattered like confetti on a city street, you are the embodiment of courage in the face of crisis. Before this story fades into the back of our minds and is reawakened by anniversaries, foundations and scholarships set up in honor of those killed, let’s try to remember this full force of solidarity in the face of an evil act. And never forget what was lost just as the families of Krystle Campbell, Martin William Richard, Lingzi Lu and Officer Sean Collier won’t forget the empty place at their family table.